Want to grow your own nutritious organic food garden? Whether you grow in containers or a garden, it can be overwhelming trying to figure it all out. Who wants to waste time, money and energy only to experience disappointment? Imagine growing healthy, healing foods you can enjoy every day, while reducing food waste and living more sustainably. With a little help, good planning and design – even in a small space, you can maximise your enjoyment and edible rewards. 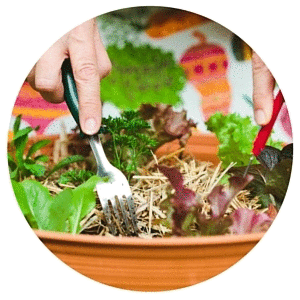 If you’re a beginner or just want to get better at growing an edible garden, I can help you avoid mistakes, disappointing results, pests and diseases, a weed-filled garden and other common problems. This website is designed to help you take shortcuts, so you can learn to grow healthy, nutrient-dense food quickly and easily. I invite you to watch this video to learn more. As a first step to growing an edible garden, I invite you to subscribe to my FREE Newsletter. Every month I share organic and sustainable gardening tips to help you grow nutritious food and special offers. 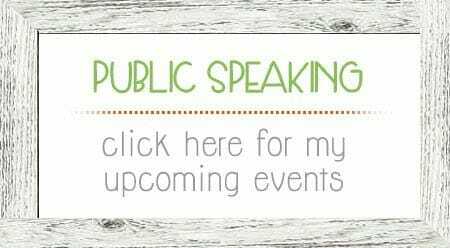 It’s short and sweet with quick tips, inspiring ideas and easy-to-follow information you can learn from. Want to dig a little deeper into growing a sustainable, productive and healthy edible garden? 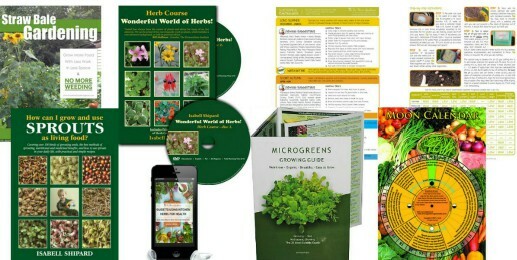 Looking for helpful resources, books, DVDs and gardening guides? I’ve created and curated a range of sustainable and economical products and services to help you build your knowledge about herbs, microgreens and sprouts, making your own potting and seed raising mixes, moon planting, worm farming, strawbale gardens and much more. 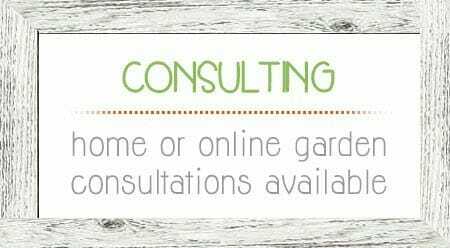 If you need personalised one-on-one help, I also offer on-site visits and online chat services to help you design your space, troubleshoot frustrating problems and fast track your garden goals for success. One of the easiest ways to start your food garden is to begin with a few fresh herbs. They not only provide you with delicious flavours in your meals, but also aid digestion and can help support a healthy immune system. Herbs like basil, parsley, chives, garlic, rosemary and oregano have SO many uses to boost health too. 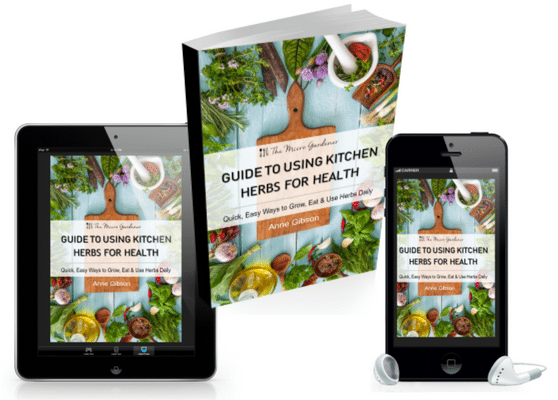 In my latest book, I guide you with actionable step-by-step instructions to plan your space, create healthy soil, and learn to grow, harvest, store and use 25 common edible herbs indoors and out. I promise it’s a fun read as you discover ‘plant parenting’ skills to boost your confidence ‘raising herb kids’ and using herbs daily. This reference guide is easy-to-follow for beginners, but also packed with a wealth of information for experienced gardeners to deep dive into plant profiles, recipes, remedies and research, so you can layer your learning over time. Ever wondered what ants are doing, why they are there and how to get rid of them naturally? They may be a clue to other problems in your garden like pest insects, hydrophobic soil and watering issues. Learn how they can help you diagnose these issues and what to do about them. Discover the best shade tolerant vegetables to grow in limited sunlight; pros and cons of a shady garden; how many hours of sun you need + 8 tips for growing vegetables in the shade. If you have a small food garden, clever design and careful plant choices are vital for success. These 10 space-saving ideas and tips will help you optimise your harvests. If you're feeling the stresses of life and looking for natural ways to find relief, these 3 herbs may be an easy way to feel calmer and relax. Tips to Grow Food in Hot, Dry or Windy Weather: Learn 3 ways to protect your crops from challenging hot, dry or windy conditions + tips for watering your plants to minimise problems. Learn how to grow zucchini, squash, marrows, pumpkins, cucumbers, melons and gourds - members of the Curcubitaceae, Squash or Gourd family. Tips on where and when to plant, seeds, pollination, varieties for small spaces, harvesting and more.